This is since version 3.2 of Weather Station (and if you have not yet upgraded, I really encourage you to do so) that the scheduled tasks of the extension are accessible via a dedicated interface. The view that shows you the task list tells you, for each task, the frequency of execution, the average observed duration and the time of the next execution. The main purpose of this information is to verify (through a joint reading of the events log) that the task scheduler for your WordPress site is properly set and works well. 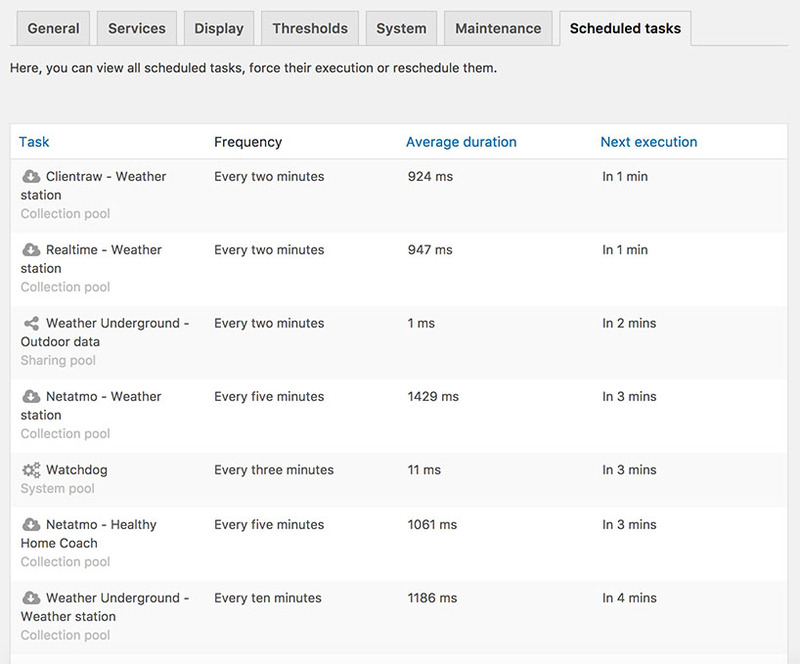 Collection pool: tasks that collect data – to retrieve weather information from weather stations. Sharing pool: the tasks that disseminate information retrieved from the weather stations. System pool: all other tasks essential for the proper operation of Weather Station. Force execution now: as its name indicates, proposes not to wait for the actual scheduling of the task to execute it. Reschedule: allows to postpone the execution of the task to the next cycle. For example, if the task is to run in 2 minutes, and is supposed to run every five minutes, using the “reschedule” command will defer the task to run in 7 minutes . Note that a particular task in the system pool called Watchdog does not display these commands. This is normal: the Watchdog task, which is intended to supervise the execution of other tasks, can only be restarted. Do not see the “Scheduled tasks” tab? It’s time to become a time sorcerer!